Happy New Year and an IPad Giveaway! - Chocolate Chocolate and More! I’m so excited! Happy New Year everyone! It’s 2013 and the best way to start out the new year is with a new toy. Well a new toy for you anyway. I’m now the only person in my house that doesn’t have a tablet of some sort. Too bad I can’t win this, but you can! 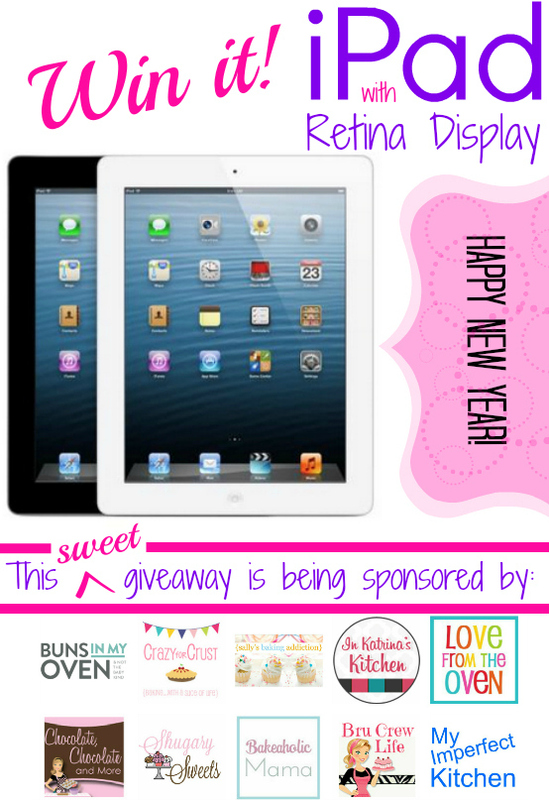 Buns in my Oven, Crazy for Crust, Sally’s Baking Addiction, In Katrina’s Kitchen, Love from the Oven, Shugary Sweets, Bakeaholic Mama, Inside Bru Crew Life, My Imperfect Kitchen and little old ME have teamed up to give you, our wonderful readers a chance to win a brand new 16gb IPad with Retna Display. Entering is easy. Just follow the Rafflecopter Directions and Good Luck! And we have a Winner! Congratulations to Derek Peake! Contest will end on January 15, 2013, 11:59 pm Eastern time. Open to US and Canada! My so would love to have this. It would be useful in school. I would use my iPad mainly for recipes. Plus I have some free digital magazines I can’t claim since I only have my little iPhone. The first app I would put on my new ipad is Fairways Solitaire! Thanks for the contest!!! The first app I’d add would be Amazon! Thank you for the opportunity! Happy New Year! Not sure what’s out there. A recipe organizer? An app that keeps an inventory of what I have and then what I need to purchase. I’ll download the Kindle App! Any Disney app. We’re huge fans in our family. Thank you one and all for this opportunity on a chance to win! Havinh one of these would be amazing! No longer reading on my tiny phone or old computer in the mini-den. I have no idea what ap I’d add first! Maybe kindle. I have no idea where I would start, would love to have an IPad! Oh I am swooning at the possibilities! While I (still) am recovering from the bad economy, I can only dream about owning such a wonderful tool. I would download a scheduler/organizer (like a work-flow type of app – is there such a creature out there?) AND I would use this as my portable portfolio, showing my photography while out and about on location, and in client conferences while placing their orders. Yes, I’ll sneak in a couple of games, too, I am sure : )- THANK YOU to all who are making this give-a-way possible! Peggy at DogBreedz.net – pet photography and gifts in celebration of YOUR pet! Oh my goodness, too many apps to choose from–probably FB or PInterest! Instagram is the first app I would download. I’ve been dying to try it! Instagram 🙂 Great giveaway, thanks Joan! Blackboard. I am an older college student. I have 4 kiddos and not having to drag my laptop around with all the kids stuff would be great! Thanks for the giveaway! I think Facebook or Nook. would love this….there are some apps that only come on the iPad. The first app I will download is Instagram. First app…Instagram. Thank you…hope I win! I would download all the social media apps first! Probably a little boring, but I’d probably download Facebook first. Thank you wonderful ladies for sponsoring such an amazing giveaway! I’m not certain..facebook, probably. Best of luck to everyone! <3 and hugs! Hmm, not very familiar with all of the apps, but I’d probably download facebook first! download anti virus first…great prize.. Thank you to each and every sponsor on this wonderful giveaway. I would be downloading pinterest & instagram. Great giveaway! Shoot I am not sure what I wouldget first, good qestion. Guess I would start with Facebook, then some recipe sites. Have so many things that would apply. Thank you for the opportunity to enter. Heres hoping. I would head right to Instagram, love looking at pictures. I need this for all my tons of recipes. Hope I win! Love your site. Thank you for the chance to win! It would be Amazon so I can download all the e-cookbooks that I want. I would probably download Kindle first. A direct link to Chocolate, Chocolate and more. It would be a web app. Angry Birds. Not really an app, but that will be first!! I don’t know, since I am computer challanged and my daughter would have to help me. I would download a recipe based app first! This would be such a blessing for my autistic daughter – she could use it to “talk”. A cookbook app! I have one on my phone and one on my computer, but one on a tablet would be much more handy! I am sure it would be facebook though knowing me if blogspot had an app , I’d do that one first so I could check my wonderful food blogs I read daily like this one..
this is a good site to check out! My First App would be Facebook!! Pinterest would be my first app downloaded! Amazon video…then I’d explore the app store. I’ve never had an ipad, so that would take a while! Well, first would be the Wells Fargo app for my banking needs, then Amazon, Pinterest & Facebook would follow! I’m not sure – I’ve never had a device that uses them. Probably a word game. O’ How I Need One of These – Pick me!!!! Would love a new iPad. Would use it for everything! Draw Something. It’s really fun to play with friends. I would use it to read & comment on blogs I follow. I’m sliding in here at the last minute to enter, Joan! Such a wonderful give-away! First app would probably a bible app, there is just so much i think i could get done. Hopefully get more organized!! I would losd a bible app and then load facebook. Kindle and B&N reading apps! Is there a special chocolate app?? ?